Every business experiences external influences which they need to manage properly. Every business experiences external influences which they need to manage properly. They normally have less control over this. 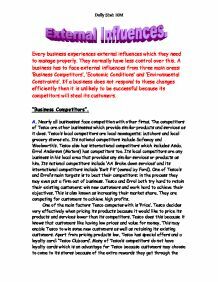 A business has to face external influences from three main areas: 'Business Competitors', 'Economic Conditions' and 'Environmental Constraints'. If a business does not respond to these changes efficiently then it is unlikely to be successful because its competitors will steal its customers. "Business Competitors". A. Nearly all businesses face competition with other firms. The competitors of Tesco are other businesses which provide similar products and services as it does. Tesco's local competitors are local newsagents; butchers and local grocery stores etc. Its national competitors include Safeway and Woolworth's. Tesco also has international competitors which includes Asda. Errol Anderson (Motors) has competitors too. Its local competitors are any business in his local area that provides any similar services or products as him. Its national competitors include 'AA Brake down services' and its international competitors include 'Kwit Fit' (owned by Ford). One of Tesco's and Errol's main targets is to beat their competitors; in the process they may even put a firm out of business. Tesco and Errol both try hard to retain their existing customers; win new customers and work hard to achieve their objectives. This is also known as increasing their market share. They are competing for customers to achieve high profits. One of the main factors Tesco competes with is 'Price'. Tesco decides very effectively when pricing its products because it would like to price its products and services lower than its competitors. Tesco does this because it knows that customers like having low prices and value for money. This may enable Tesco to win some new customers as well as retaining its existing customers. Apart from pricing products low, Tesco has special offers and a loyalty card: 'Tesco Clubcard'. Many of Tesco's competitors do not have loyalty cards which is an advantage for Tesco because customers may choose to come to its stores because of the extra rewards they get through the Tesco Clubcard. ...read more. So Tesco can just wait and watch. Asda may increase their prices because even they may be making less profit too. Since Asda is an international competitor this change will affect many stores of Tesco. Tesco should think about opening more stores internationally in countries where there are no Asda stores. If Safeway improve the quality of their products and customer services and make it really impressive that many of Tesco's customers decide to go there. Tesco should try and come up with something that will attract customers rather then just matching themselves up with Safeway. A better idea would be to match up with Safeway and also do some forward thinking so that they can also come up with something attractive of their own. This is the best response because this could also help Tesco prevent itself from losing its customers in the future. Even though this may cost Tesco, it should recover the cost over all the customers that it will get. Tesco should avoid responding in a way that will make the business go into a loss. An example of a new invention/idea is: to concentrate on a particular market segment such as 'Age' and do research on it to come up with a suitable attractive item or service. Tesco may choose to design more clothing for Teenagers or even for all ages then it currently is. Tesco can also come up with a new way of selling, maybe a system like Argos but instead of the customer going there and ordering they can order on the telephone and then go and collect there shopping when it is ready. This can cut down the queuing time on checkouts. Before Tesco does anything it will need to do research maybe questionnaires to find out what the customers want. This change of Safeway will only affect the Tesco stores in the UK because Safeway is a national competitor. ...read more. I would suggest Tesco to buy goods from UK farmers if it is cheaper. It should consider buying its own farms, to grow its own products for its stores. It may be impossible to grow all products in the UK. Also when the value of the pound falls (has a higher currency) foreign buyers will be able to buy more products in the UK with their currency. They will find it cheaper and so may buy products from Tesco. If Tesco wants this to happen then it will have to advertise its business to make them aware that it exists. When the currency of the pound decreases this means that the pound is stronger. Tesco should try and import as many of its products as possible because it will be cheaper. Also when the value of the pound rises, Tesco may lose some of its foreign customers because it will be expensive for them. When the interest rates increase I would suggest Errol to: not borrow money because it will cost him more. If he has savings then he should use them instead. Errol's customers who were going to spend a lot on their cars may postpone their appointments with him because if they keep that money in the bank they would get a higher reward for it or maybe because borrowing money would be expensive. Customers may also not buy expensive products from him, so Errol should try and get cheaper products even if they don't have a good quality. When inflation levels rise Errol should consider having some sort of special deals with his customers because it may encourage them to buy his products or services. Errol has to do this to attract customers because they would have less money to spend. Errol may even have to reduce his charges and do some advertising. When the value of the pound increases I would suggest Errol to import most of his supplies because it would be cheaper for him. Since he will get the items cheaper, he can lower his prices to win new customers. Dolly Shah 10M ...read more. As the firm produces more and more goods, so average cost begin to fall because of: * Technical economies made in the actual production of the good. For example, large firms can use expensive machinery, intensively. * Managerial economies made in the administration of a large firm by splitting up management jobs and employing specialist accountants, salesmen, etc. If the rate of inflation was high, people will be spending less, as their income will be less. This will also lead to the increase of the prices of goods. 3. Explain the types of unemployment and assess their impact on your chosen business. When Morrison took over Safeway who benefited? 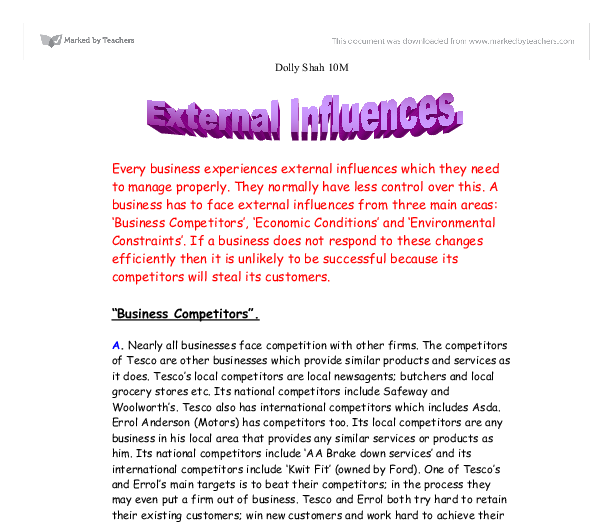 Changes in the business environment and their impacts on business strategies. This same low inflation that encourages borrowing also makes excessive debt more dangerous, because unlike in a high inflation economy, borrowers can no longer rely on inflation to erode their real debt burden if they need or decide to liquidate. Energy Prices- Energy prices rise as do interest rates and taxes, so if electricity costs were to be rise this would mean that it would cost Tesco more to run their machinery and this would lead to price increases. the benefits stay the same and so the overall external cost is labelled x. Another failure the congestion charge was intended to correct was the number of people using public transport in central London. Too few people were using it and so the congestion charge aimed to change this. Neither are they affected by regulations on packaging. Although the goods they handle have packaging, this is 'sold on' with the product to the customers. Any unwanted man-made sound that penetrates the environment is noise pollution. Noise pollution can be caused by many sources including highways, vehicles, factories, concerts, air-conditioners, engines, machine, aircraft, helicopters, alarms, public address systems, industrial development and construction work.